You might have seen that the field “Name in URL” first gives you the value and the editor needs to click “change” to edit it. You can also accomplish this on your normal string properties by using the UI Hint “previewabletext” (also found as the constant UIHint.PreviewableText). I’ve found a neat way to improve the editor experience – IContentTypeAdvisor and it can be found in the EPiServer.Cms.Shell.UI.Rest namespace of the assembly EPiServer.Cms.Shell.UI.dll. 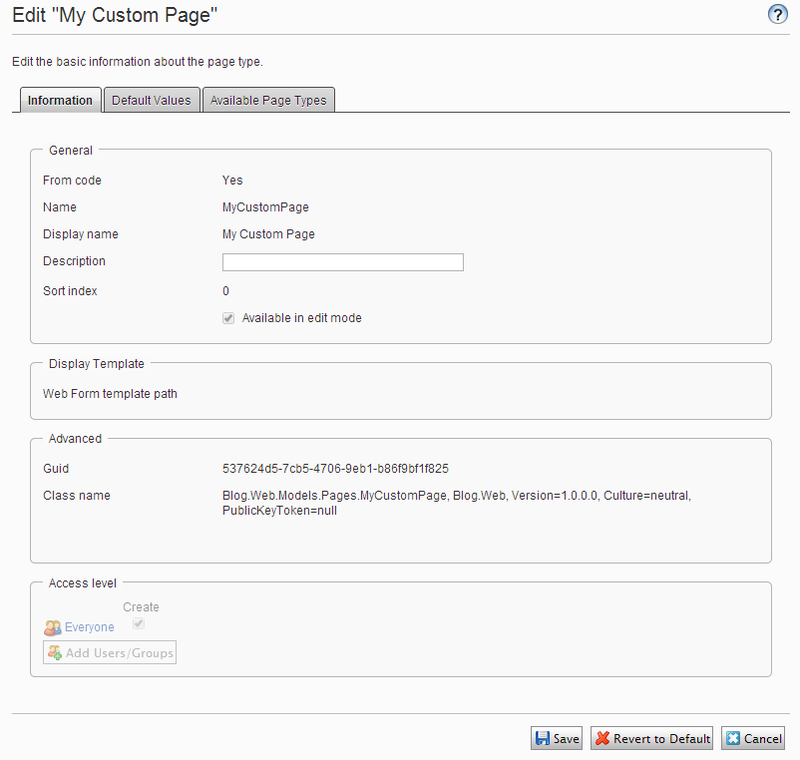 This interface is used to populate the list of suggested Content Types when creating new content. The parent item where the editor wants to create the new content. This is true if the editor is creating your new content within a Content Asset Folder. This is a list of the kind of content to create. The value comes from the UI and therefore they are just strings like “episerver.core.blockdata” or “episerver.core.pagedata”. If created through a component in the asset pane it can also have the value of the CreateableTypes. 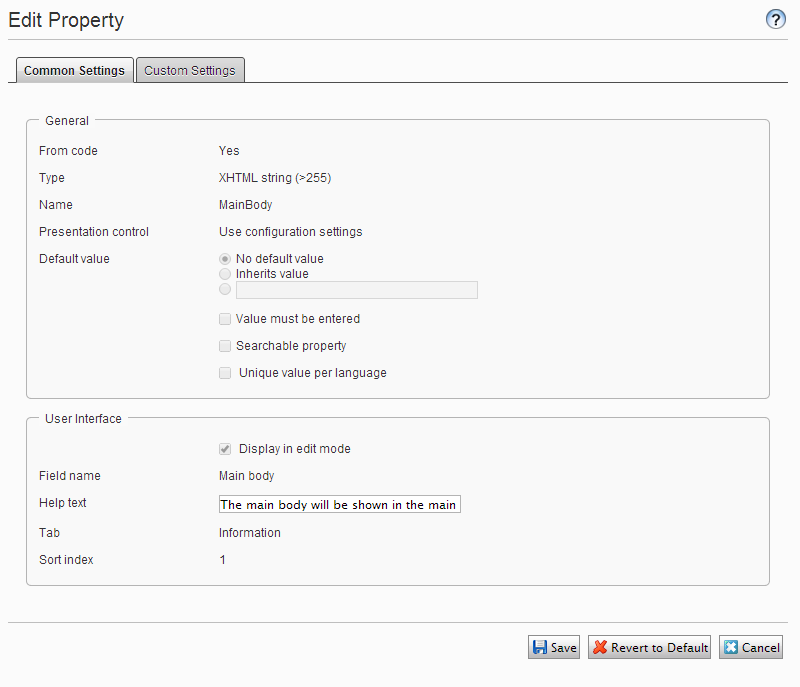 The default implementation in Episerver is to suggest the same content types as already created. An example of usage would be to help the editor create a slideshow where the slideshow including each slide in it are blocks. So what I want to do is to suggest the Slide block if the editor already has created a Slideshow block in that same folder. First of all I’ve have some new Block Types, one for the Slideshow that has a ContentArea where you put each slide represented by a SlideBlock. And I will need to create an implementation of the IContentTypeAdvisor. Note that I’m registering this to Episerver’s IOC using the ServiceConfigurationAttribute. This is to tell Episerver that I want to use this implementation. Episerver looks for all registered implementations of this interface instead of just 1, therefore I don’t need to do anything with the previous registrations (unless I want to, see further down). What I want the advisor to do is check is whether the parent has any children that is a Slideshow block. If so the advisor will suggest the Slide Block. This is quite easy as can be seen in my SlideshowContentTypeAdvisor. It is also a good practice to check whether the suggested content type (in this case the Slide Block) is available as child to the content parent and that the editor has the proper access rights to create a Slide Block). But I want to use my Content Type advisor INSTEAD of the Default one? It’s easy to remove the already registered implementation of IContentTypeAdvisor by implementing the IConfigurableModule interface, remove the current registrations and to register your own implementation instead. Look at my DependencyResolverInitialization for that. Look at DependencyResolverInitialization and just don’t register your own IContentTypeAdvisor after ejecting the existing registrations. This will remove all registered implementations and your editor will never see any suggested content types. If you need to organize the content among Assets, such as blocks and media, you can do this by creating your own Content Types that inherits from ContentFolder. Unfortunately the Episerver UI only supports creating Content Folders in the folder section of the Asset pane, so you’ll need to find a way to create these new folders. If it’s a strict structure it’s very easy using the ContentRepository in Episerver. But if the editor should create them you’ll probably need to create a separate view for this or do some Dojo tweaks. I might look more into the first option using some inspiration from Fredrik Vig‘s “Instant Templates“. But for now, let’s focus on creating folders that only allows specific types. 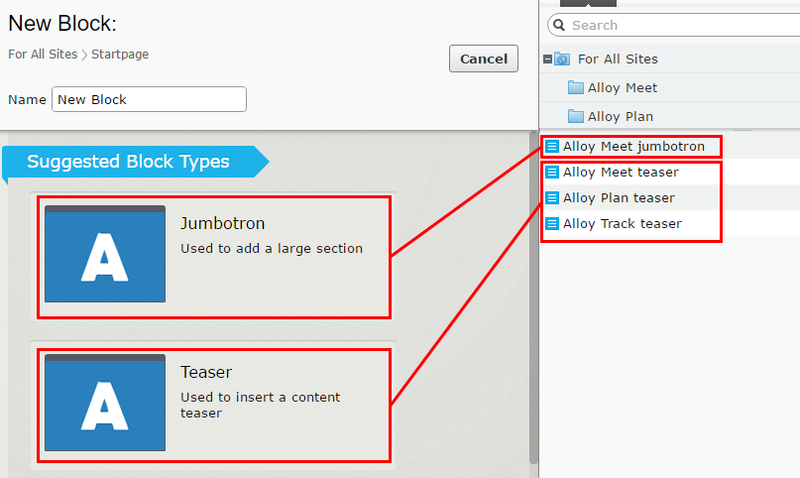 First of all, I need some Content Types that represents my folders – one that only allows Teaser Blocks and one that only allows Image Files, see Alloy Templates to look further into these two Content Types. 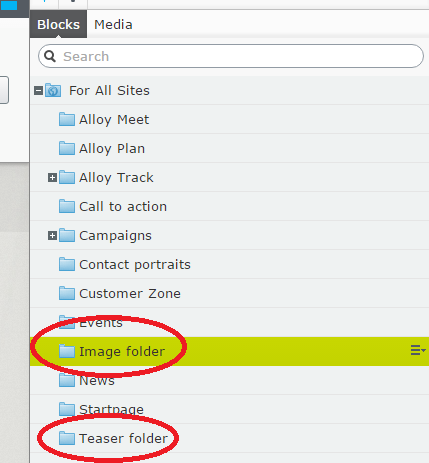 This will make sure that you’ll have two folders in the Assets Pane. So when I try to create any Blocks in the Teaser folder, I’ll only be able to create a Teaser block, and as usual when I’m only able to select one Content Type, it will automatically select it without giving me a list of available Content Types. And when I try to upload files to the Image folder, I will only be able to upload files of that specific Media Type. Which in this example means, only images and not text files. And when I try to create a Block in the Image folder, I will not be able to select any Block Types since none are available. If you’re a Dojo Guru and have a way to tweak Episerver UI to allow the editor select which type of folder to create, please hit me up! Are you tired of Administrators changing your Content Types and breaking your web site? Fear not, I’ve found a cool hidden gem that allows you to disable fields when editing Content Types in Admin Mode – the EPiServer.DataAnnotations.AdministrationSettings attribute. 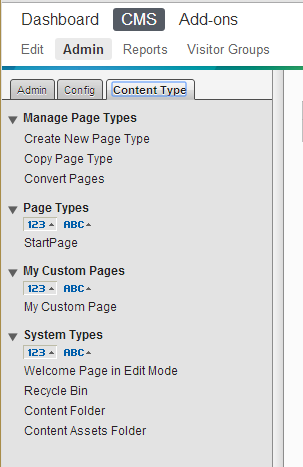 The GroupName is used to group your Content Types in Admin mode. If you simply want to hide your Content Type in Admin Mode. An integer where you define the sort order inside the Group. If you simply want to disable changes for the entire Content Type. This is an enum flag that only enables certain fields on the Edit Property view for the Content Type. Note that if you create a Property, it cannot be saved unless you allow the required fields. I have only enabled the Help text with PropertyDefinitionFields = PropertyDefinitionFields.HelpText. Same as PropertyDefinitionFields but with the fields for your Content Type. This attribute will help you organize your Content Types and to disable editing capabilities for Content Types you really don’t want an administrator to mess with. But use it wisely! Having many and small groups can make a mess for the administrator and yourself.